When you’re small, waiting for anything can seem to take a lifetime, especially when it’s a baby! There is so much to sort out for the new arrival – clothes, toys and a place to sleep. A new addition to any family is exciting, but the experience can also be worrying and confusing for siblings. Coping with the new situations and emotions that arise can be very challenging. 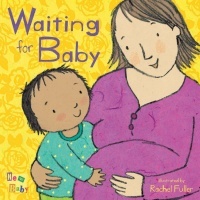 This series of four board books deals with the anticipation of waiting for the new baby, the excitement of the arrival itself, and the beginnings of the special relationship that develops between siblings. The simple conversational text and lively illustrations are carefully designed to encourage further dialogue between reader and child.